Thanks in advance for taking the time to consider us on your short list of Wedding Photographers. 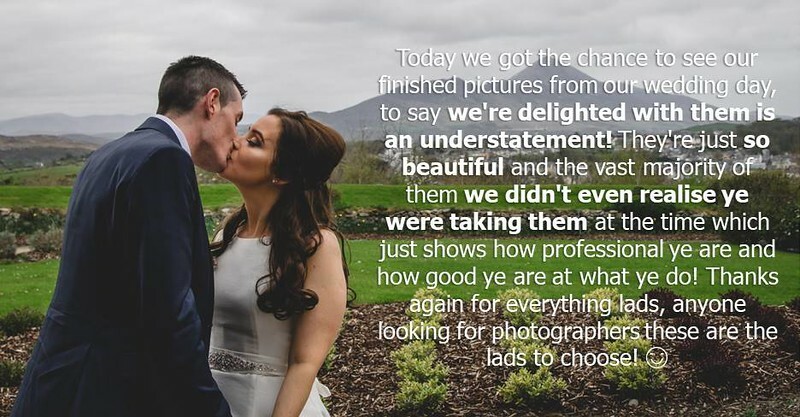 We genuinely appreciate it so much and look forward to talking with you about your Wedding Day…Exciting times ahead..
David & Kieran here, two best friends who are following our love of Photography and documenting Weddings throughout Ireland and abroad (if anyone feels like sending us :) ). The idea of taking photo's that stand the test of time and become memories for generations of people to come is something we absolutely love and was something that drew us to Photography in the first place. To capture candid moments of people on days when they are most at ease among family and friends is a pleasure and we feel these always allow for the best type of photos for our clients and us. We would love if you invited us into the joy and excitement that will be your wedding day so that you become a part of this journey with us.